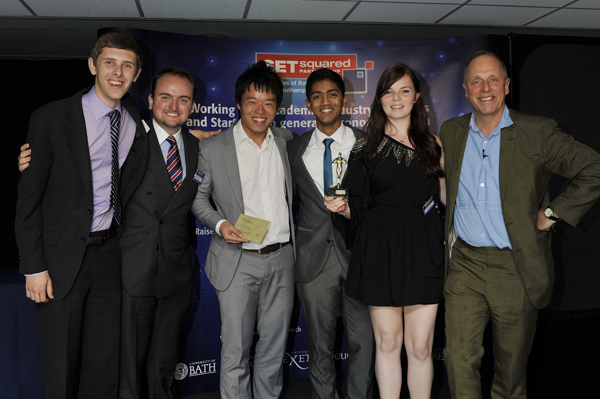 SETsquared announced the winners of its second annual student entrepreneurship awards last night in front of the business, investor and entrepreneur community of Southern England. These awards recognise the most promising up and coming entrepreneurs and student businesses. Guest presenter Simon Woodroffe OBE, founder of YO!, inspired the student entrepreneurs with his experience of creating a set of successful businesses under the YO! brand. The winners were chosen from the 90,000 students at the five SETsquared member universities of Bath, Bristol, Exeter, Southampton and Surrey. The diverse and bold entries ranged from renting online gaming servers by the hour to fashionable and ethically made socks sold for local homeless and from student handout/lecture note banner advertising to an exclusive club for recent graduates. Best Graduate Start-up – UniSport – highly commended in last year’s awards, UniSport provides live online coverage of UK university sport. Think of them as Sky Sports for British student sport. Best Social Enterprise – FoodCycle Bristol – every Sunday, students collect on bike trailers, surplus food from local shops for a community kitchen and prepare a free three course meal to those in need. Best Student Start-up – The Underground Bookclub – provides commuters a metro-style free magazine but instead of news, it has the first few chapters of new books to try and perhaps buy. They already have funding and trials have been very encouraging. Best Student Enterprise Experience – University of Bath’s Student Enterprise Shop Competition – where nine teams of students were given a loan and one day trading to make the most profit. People’s Choice Award – University of Surrey’s SIFE entry Ricycle, helping rice farmers in Thailand be sustainable. This award event is one of the many ways SETsquared supports student entrepreneurship. A full year-long programme of activities includes the Kauffman Global Scholars Program, a Deloitte business pitching contest, Xing business planning and a number of enterprise boot camps. SETsquared is also holding an “apprentice” style trading day at Spitalfields Market called Uni Popshop on June 28th when student teams will compete to see who can make the most profit in one day.